If you're not familiar with the "works for hire" scandal, you can read the full background here. Basically, a Congressional staffer by the name of Mitch Glazier snuck a tiny unnoticed amendment into a much larger bill in the middle of the night -- supposedly at the request of the RIAA -- without telling anyone. It effectively changed the definition of music recordings into "works made for hire," which was really important, because it meant the RIAA labels could hang onto musicians' copyrights for much longer, avoiding termination rights that let musicians reclaim their copyrights. Just a few months later, Glazier left his low-paying Congressional staffer job for a $500,000 job with the RIAA, which I believe he still holds ten years later. Thankfully, people quickly recognized what he had done and Congress had to go back and fix Glazier's sneaky wording. However, it is worth noting that the peak of this chart is right when Glazier inserted his infamous four words. As we discussed last fall, now that musicians do have termination rights, they're lining up to use them and take their copyrights back from the labels. They can start getting the copyrights back in 2013. If you're looking for a date when the bottom totally falls out for the RIAA labels, that may be it. 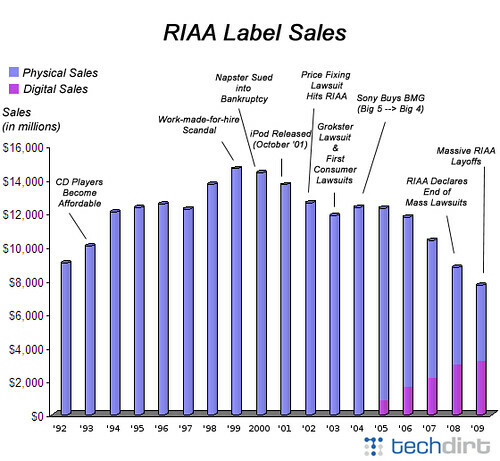 When the rights to their back catalog starts to drop out, this chart looks even worse. The RIAA won't give up easily, of course. The latest stunt they're trying to pull is to "re-record" albums, claiming that it creates a brand new copyright, that gives them another 35 years before termination rights are applicable. That is, of course, ridiculous, but the RIAA will likely try to fight it out in court for many years to extend that 2013 deadline by a few more years. Of course, all that money on legal fees could have gone to innovating, but that's just not the RIAA way. Note that digital music sales is not even close to being a savior. The total is still dropping rapidly. Of course, many have argued that the rise and fall may have a lot more to do with CD replacements of previous formats -- and this chart certainly suggests that could be an explanation. The big jump happened right when CDs became affordable, and people needed to go out and replace their vinyl and cassette (and 8-track!) collections. After a few years of that, it makes sense that the market should drop anyway. Once again, it's important to point out that the chart above is not the entire music industry, but a limited segment of it: the RIAA record labels, mainly comprised of the big four record labels. It doesn't take into account all of the other aspects of the music business -- nearly every single one of which has been growing during this same period. It also doesn't take into account the vast success stories of independent artists and labels doing creative business models and routing around the legacy gatekeepers. idiot. if that is all you can contribute, mike is overpaying you. replace music industry with recorded music industry and get back on point. oh wait, you are trying to shut down a very logical explanation. you techdirt people are frigging transparent.